** Please note: DetectXSL is no longer supported but is still made available for those that may find some use for it. Why is DetectX Swift so fast? Join our community of helpful users in the Sqwarq Slack Group. Get access to support, latest news, bugs, docs, tips, promos, and more! Let’s start with what it isn’t: it’s not an AV Scanner that wastes your system resources scanning harmless files. It’s not a ‘clean up’ app that pretends to speed up or improve your mac’s performance, and it’s not an uninstaller or app remover for other apps that leave around file litter. It is, rather, a lightweight, on-demand dedicated search and troubleshooting tool, probably the fastest of its kind, that can identify malware, adware, keyloggers, potentially unwanted apps and potentially destabilising apps on a mac. It can also help you (or us, if you consult us), to identify unknown and novel threats through its Profiler and History functions. To learn more, please browse the links above to the docs, video tuts and helpful articles. Or drop us a question at Sqwarq support. We’re also on Twitter, Line (@sqwarq) and Facebook. For home use? Nothing if you prefer! 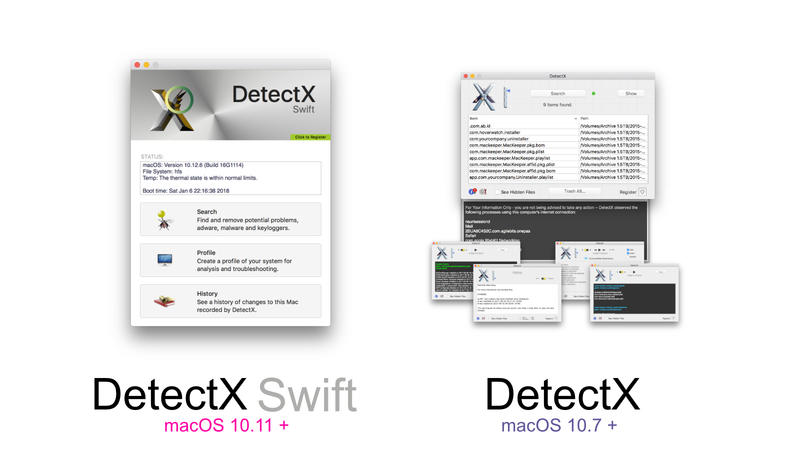 DetectX and DetectX Swift are shareware, which means you can go on using them without sharing a cent! That said, we can only continue development if enough people do share, so there is an optional $10 Home registration key for each product available through the app interface (note that these are not transferable from DetectX to DetectX Swift or vice versa). For teams, organisations and those wanting to use DetectX Swift’s command line tools beyond the initial 20-day trial period, you guys need to buy a Pro or Management license. If you would like to upgrade from a DetectX Commercial license to a DetectX Swift Management license, please contact Sqwarq support. There are no authorized resellers of any Sqwarq Home registration products, including DetectX and DetectX Swift. If you are interested in becoming an authorised reseller of our Pro and Management licenses, please contact Sqwarq support for terms and conditions. Follow @sqwarq on Twitter to keep up with new releases and updates.